David Perron is second on the Blues in scoring despite missing the last three games. ST. LOUIS — David Perron, the team’s second most consistent player this season behind All-Star Ryan O’Reilly, won’t be available when the St. Louis Blues open the second half of their season Saturday at Columbus. 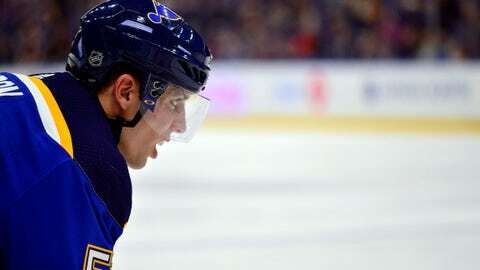 The Blues announced Thursday they have placed Perron on injured reserve with an upper-body injury. Perron missed the Blues’ last three games before the All-Star break. He last played Jan. 17 in a loss at Boston. At the time of his departure from the lineup he was enjoying a league-best 13-game point streak. Perron, 30, ranks second on the Blues with 35 points in 45 games. He is tied for second with Vladimir Tarasenko with 17 goals (one behind O’Reilly) and also is tied for second with Brayden Schenn and Jaden Schwartz with 18 assists.